How can a car with no #Real Riders be in the #Replica Entertainment line? Is Mattel getting cheap? Short answer: No. This was the reaction of a handful of vocal collectors across social media when it was shown that the latest iteration of the iconic DeLorean Time Machine from the #Back to the Future (BTTF) movies, would be in the second mix of #Replica Entertainment for 2019. The casting is the #Back to the Future Time Machine – 1955. Its from Back to the Future Part III (1990), and it wears the brand-new #8-Spoke Wagon Wheels. Yes, I know it doesn’t have any tires… have we gotten past that yet? See, the #Replica Entertainment line is just that… replica #TV & Movie Cars — and video games too. In order for Hot Wheels to create BTTF Time Machine that was seen towards the end of the 3rd movie, they had to develop an “1885 wagon wheel” just like the one in the movie. Since there were no rubber tires in 1885, and this car was “built” to be pushed down the railroad track by a train, it makes perfect sense why the Hot Wheels car does not have #Real Riders — because it shouldn’t! This is actually the third time we’ve seen the #BTTF Time Machine – 1955 casting, and I’ve lost track mentally on how many times we’ve seen the BTTF Time Machine in general. The “1955” casting was designed specifically to resemble that Time Machine from the third movie, with the previous two variants focusing on how it appeared in the beginning of the 1990 movie: with red wheels and white-wall tires. Overall, its a great replica release of the BTTF Time Machine. I have to assume that we will see it again OR see the #8-Spoke Wagon Wheels in some other capacity since I am not sure if there has ever been a Hot Wheels wheel that has only been used once, on one specific release. For you guys that race your Hot Wheels, keep in mind that this is a metal/metal #DeLorean with plastic wheels. The thin lip on the inner portion of the tire makes me hypothesize that this could be pretty fast on the orange track… something that I may have to test if I get another. As for now, this #BTTF Time Machine – 1955 is showing up now at retail in the second wave of #Replica Entertainment for 2019. Its actually one of two #Back to the Future cars in that mix with the other being Biff’s Ford Super De Luxe with manure. Get them now before you’re “OUTATIME”. RELEASE DETAILS: Unpainted “ZAMAC” Body (metal). Clear Windows. Black Interior. Brown 8-Spoke Wagon (8SPW) Wheels. Black Base (metal). Made in Thailand. Toy# FLD25. Release in 2019 as part of the Replica Entertainment line. I really like this one, but I’m unsure if I’ll get one because 1) they’re $8 each, and 2) I already have the red wheel version. 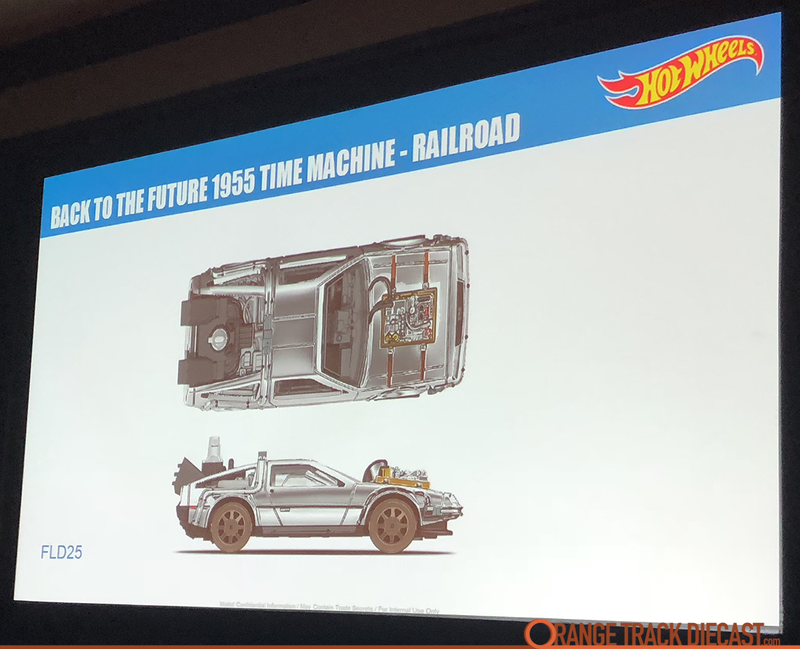 Also Manson told me that the wheels are called “Back To The Future Railroad Wheel”, and if/when it gets repurposed it will get an official name, but hopefully with not much change to the current placeholder name.